There are football games, like Rams-Saints and Packers-Patriots just last Sunday, that are worth watching for not only who wins but for all the wonderful fantasy points as well. And on the other end of the spectrum is a game like Redskins at Buccaneers. This just handed to me…NBC was not kicking down the NFL’s door to flex this game to Sunday night. 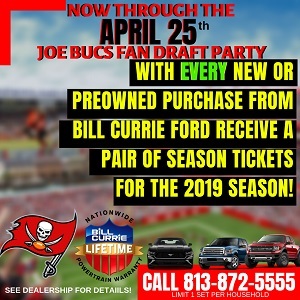 Jay Gruden’s Redskins play a conservative brand of offense and Dirk Koetter’s Bucs only seem to put up points these days when they are down three scores or more. 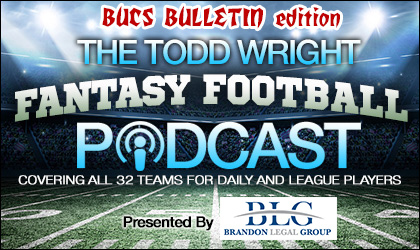 Todd spotlights how each of these teams has one clear fantasy play and tries to find something else of fantasy relevance in this Bucs Bulletin Edition of The Todd Wright Fantasy Football Podcast, presented by Brandon Legal Group. Click above to listen or to download, or at iTunes, Google Play, and via Podbean and more platforms!